With the whirlwind Tuesday night that saw Odell Beckham Jr. being shipped from the New York Giants to the Cleveland Browns, former first-rounder Jabrill Peppers got lost in the shuffle. The Giants reportedly thought highly enough of the safety to ask for him specifically in trade talks to replace Landon Collins though. Let’s examine exactly what New York is getting in their newest defensive building block. When the Browns selected Peppers with the 25th pick in the first round of the 2017 draft, eyebrows collectively raised across the nation. With a ton of draft capital, they took a player at a non-premium position, who didn’t play safety at Michigan, was too small (213 pounds) to stay at linebacker, and didn’t even grade out well at the position he played. It was also a player who was PFF’s highest-graded kick returner in the nation and had freakishly natural ability; it was a classic high-ceiling/low-floor type of draft pick. As a rookie, Peppers was thrown in the fire, 648 of his 806 snaps came as a deep safety after he was a glorified outside linebacker during his last year in college. Unsurprisingly, it was a disaster, and Peppers’ 60.5 overall grade was one of the worst at the position in the NFL. In hindsight though, it was an incredibly valuable experience. The angles one needs to take as a deep safety in the NFL are impossible to simulate, and they need practice to perfect. 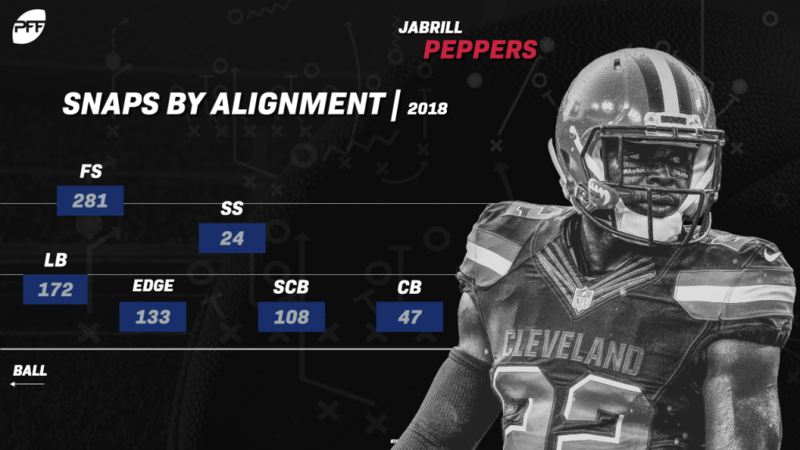 Peppers came into Year 2 as a much more seasoned safety. The Browns also came into Year 2 with much more realistic expectations. His role shifted more to a hybrid safety, a role that was far more conducive to his skillset coming out of college. Peppers lined up along the line of scrimmage or in the box on 329 snaps, as a slot or wide corner on 155 snaps, and as a deep safety on only 281. This time around though, he wasn’t a liability when lined up deep. Peppers coverage grade jumped from 61.7 to 77.3. He hasn’t grabbed the headlines like Jamal Adams, but Peppers was a productive defensive chess piece in his own right. His 12 pressures were the third-most among safeties last year, and his 23 coverage stops ranked 18th – and Peppers is only still getting familiar with the position. Somewhat ironically, the closest corollary to Peppers at the position is actually the guy he’s replacing. Landon Collins spent over half his snaps as a rookie at deep safety and got even more exposed as the lowest-graded safety in the NFL. In Year 2, Collins shifted to a box role, and the natural playmaking ability took over as he led the position in stops. In 2018 though, it was Peppers who actually graded out higher for PFF. 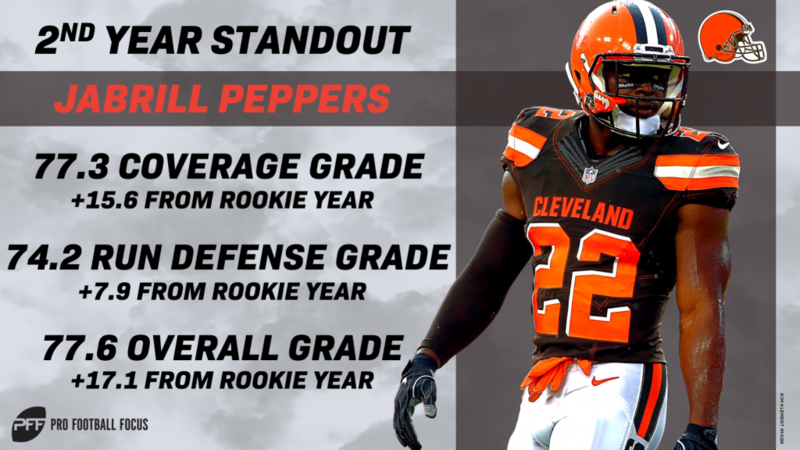 While receiving two first-rounders back might have been more exciting, getting Peppers is like receiving a first-rounder you’re certain you’ll hit on. With three more years of team control at a much lower price than Collins, the addition of Peppers in yesterday’s trade is far from inconsequential.